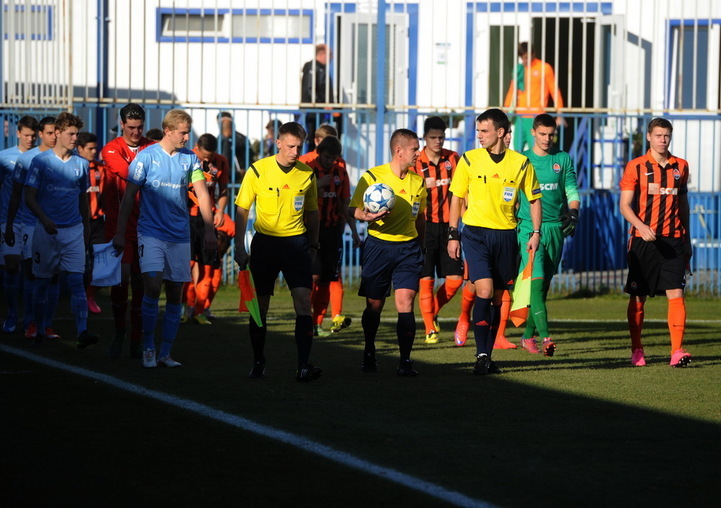 As part of the UEFA Youth League, Shakhtar U19 received their Malmo counterparts. Two weeks ago in Sweden, the teams produced goal galore (5-5), and this was the Pitmen’s first point they claimed in the group stage of the UEFA Youth League. Earlier, the team of Serhiy Kovalyov at the same stadium in Morshyn beat the Ukrainian League leaders Skala (2-0). Against the Swedish club, the Donetsk team list didn’t include Oleksandr Zubkov and Andriy Boryachuk,with the defender Volodymyr Hrachyov making his debut in this match in the current Youth League season. In the opening stages of the match, the rivals did not force things, but soon danger appeared near the goals. A Swedish defender brought down Vladyslav Bugai in the box, pulling the latter’s shirt, with the referee not observing any rule violation there. In the 7th minute, a corner near the Pitmen’s goal caused a stir in the goal area – a Malmo player shattered the crossbar. After another 10 minutes, the visitors opened the scoring following a mistake made by the Donetsk defensive line, when Redzic freely sent the ball into the corner to make it 0-1. The Pitmen were trying to establish combinational football, still failing to deliver into the opposition box, so the charges of Serhiy Kovalyov adopted long-range strikes. However, the attacks of the Swedes were more dangerous, with the Pitmen’s goalkeeper Mykyta Romanov coming to the team’s rescue three times. However, the hosts managed to seize the initiative. The most active player was Giorgi Arabidze, and it was him who on 40 minutes made a brilliant delivery from the right flank into the penalty area for Bugai, who just had to tap the ball into the net to make it 1-1. The teams left for the break having a tie. Immediately after the break, the Pitmen missed out on a chance when playing a corner, while Dmytro Topalov heavily hit a defender who was standing in front of the goal. And the pace of the game, meanwhile, slowed down a bit. On 57 minutes, Romanov coped with a difficult shot from outside the box, which was responded to by the dangerous attempts by Arabidze (went over the bar) and Oleksandr Pikhalyonok (the free kick was parried away by the keeper). In a counterattack, the Swedes wasted their chance – the striker shot over the bar from close range. In the 65th minute, Arabidze earned a penalty, once again outplaying his counterpart down the flank, with Pikhalyonok accurately converting a spot kick to make it 2-1. Donetsk stepped up their pace and could even extend the lead, though following a corner and a series of ricochets, Bugai missed the target from point-blank range. An attempt by Pikhalyonok from the edge of the box was also dangerous – flying inches over the bar. Yet in the 84th minute, Shakhtar secured the advantage: Pikhalyonok responded to a delivery into the penalty area and fed the ball to the oncoming Artur Avagimyan, who set the final score of the match – 3-1. However, in injury time Pikhalyonok could have grabbed a brace, but failed to chip it past the keeper. Thus, Shakhtar claimed their first win in the group stage of the UEFA Youth League, scoring 4 points and securing a chance of reaching the knockout stage. The Swedes have a point more, while the situation in the group will be largely clarified by the outcome of the Real Madrid vs PSG match. In the next round on November 25, the team of Serhiy Kovalyov are to entertain their Real Madrid counterparts.